NOTE: since this article was published, the Mozilla developer tools team has released the App Manager, a much more effective way to remotely debug Firefox OS apps. To find out more, read Using the App Manager on MDN. Currently we have two tracking bugs, go ahead an vote on them to bump their priority, to track the work going into developing a native remote inspector and style editor for Firefox OS but, I have some pretty exciting news. You can have access to a remote debugger today. And how is this possible I hear you ask? Well, one word: Weinre. Weinre is a project of the Apache Foundation and stands for WEb INspector REmote and is exactly what it’s name suggests, a tool in the same vein as Firebug or Webinspector but, able to run and debug web pages remotely. So, if you have used tools such as the Firefox Developer Tools or Chrome Dev Tools, using Weinre will be second nature. But enough talk, let’s get this up and running. NOTE: The -g flag is used to install Weinre as a global Node.js module for command line goodness but, on Linux and Mac, this means you most likely are going to need to run the above by prepending sudo to the above command. Above then is the landing page for the Weinre server giving you access to the documentation, some other trinkets, as well as the Weinre client, the page we really want to head to so, go ahead and click on the debug client link. 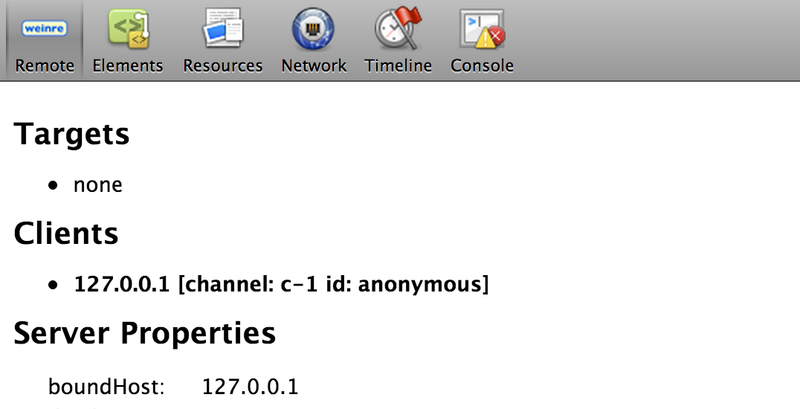 From the above you can see that we have one connected client, this is the current instance of the web inspector, some general properties of our server but, no targets. Let’s get our target set-up. NOTE: If the UI of winery looks very familiar that’s because Winery uses the same UI code as the web inspector in Chrome and Safari. Before we can launch B2G Desktop and try this out however, there is one more step. Gaia uses a Content Security Policy and as part of that scripts are said to only be allowed to load, if from the same origin as the application. So, if we were to try and load the Calendar now, the script from above would be blocked as it is not being loaded from the specified origin. As you can see, the Calendar has successfully connected and is now listed as one of our targets. Go ahead and click on the ‘Elements’ tab. Listed here is the HTML of our app on the left and our CSS on the right! You can go right ahead and edit either the HTML or the CSS as you normally would and see the changes reflect live. Note that even though the CSS looks grayed out and disabled, it if fully editable. You can also add completely new styles to the current element using the empty element.style block or amending existing rules. You will also notice you have access to the computed styles as well as metrics of the current element. First step then is to move our script import from Calendar to Dialer. Grab the code from Calendar and then open up gaia -> apps – > communication -> dialer -> index.html and paste the code. Next rebuild your profile using ‘make’ and finally relaunch B2G desktop. With the dialer open, click on the call log icon, bottom left. Currently the call log is already populated with some dummy data but, let’s create our own. Click over to the Console tab in Weinre, type the following and press enter. And as you can see now, the entry we just created has been added to storage, IndexedDB to be exact, and is visible in the call log view. As you might very well have noticed, another of the great features that comes with the console is auto-complete which will further speed up development. The combination of features that this exposes already opens new doors and will make working on Firefox OS, or writing apps for the OS, much easier with less time spent between building profiles, tearing down and relaunching B2G. Which all makes for happier developers. But hey wait a second, what about debugging on the device? This will work exactly the same as the above with one small difference, the IP. When you want to debug on the device you first need to know the IP address of your host computer. Then you need to start up Weinre using this IP as the buondHost and also as the IP when including the script into you target documents. Launch your target app and you are in business! But there is already some light at the end of the tunnel with regards to managing the injection of the script manually, disabling CSP and ensuring things are cleaned up before pushing to source control. Jan Jongboom has opened a pull request against the Gaia repo that looks extremely promising and will alleviate a lot of this so, go on and give him a hand and let’s get this merged into Gaia. Happy Hacking! An important note: None of the above would have happened if it was not for Kevin Grandon who remembered using Weinre and sent out the email that set the ball rolling. Thanks Kevin! 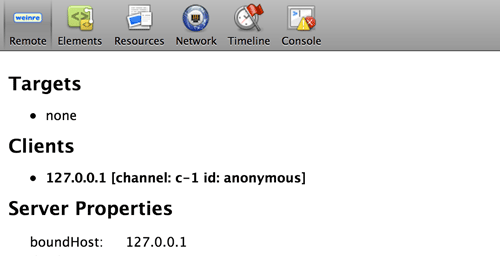 Debugging FirefoxOS with webkit native devtools?!? Blasphemy!!! Hey aL3xa, you might be right ;), but while the dev tools people finish up their work on the native tools, this is much better than having nothing. So for now, this will make developer’s lives easier on a day to day basis. To be frank, I use Chrome myself (for development) on daily basis. On that topic: it would be interesting if you tested the Developer Tools in Firefox Nightly and let us know what you think! – make JSTerm native, it’s really awesome! As Rob says, the native dev tools in Firefox has come a long way and is definitely worth your time, and once they go remote, it’s gonna be all kinds of awesome. Great thing, and many thanks and credits to Jan Jongboom @janjongboom who came up with this great idea, and figured out the details. The thing is, you can debug B2G desktop using Frefox’s native debugger, I demo’d this at Mozcamp Asia and again this past weekend at Vancouver’s App Hack Day. As you mention, you cannot inspect remotely or edit css currently but that is coming, and will involve fewer hoops to jump through than with Weinre. I am definitely looking forward to the native tools but, at the moment, Weinre fills a gap in the development tool chain when it comes to FirefoxOS. Do you perhaps have slides or a blog post you can link up here with regards to using the native debugger with B2G desktop? Absolutely, that’s one approach. But very often you want to test it in the context that it will be run in. Additionally, for testing APIs etc on your desktop, I suggest using the Firefox OS Simulator.